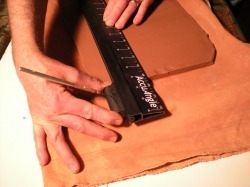 The AccuAngle is a one-step cutting and beveling tool for clay artists. No matter the level of your hand building skills, AccuAngle can help you increase the quality of your work while making the job easier and quicker. With 11 preset angles you can create basic geometric shapes from the 3-sided equilateral triangle to the 12-sided dodecagon. This bevel edge cutter has a 90-degree angle included for squaring edges. 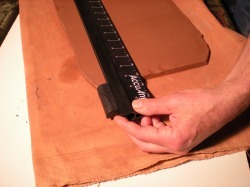 The AccuAngle ruler is scaled in inches and includes a convenient centering scale. 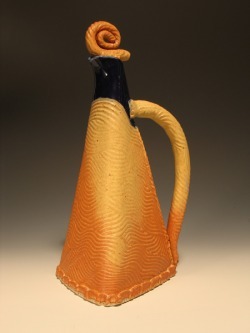 Comes in 2 sizes : 16" or 32". We also offer the replacement slider ! 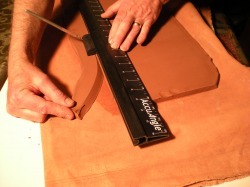 The AccuAngle is designed to use with any long needle tool. 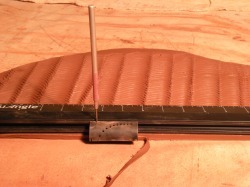 The holes in the sliding cutter are preset at specific angles. 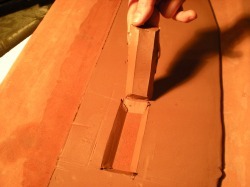 The lowest hole #3 cuts a 30 degree angle. See the list below for other angle options. 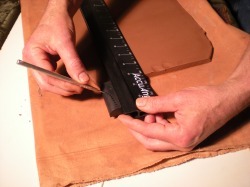 The resulting bevel cut is clean and straight. 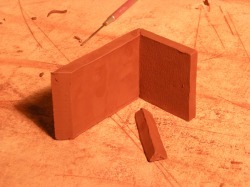 Bevels can be cut from the finished /exterior side of the clay slab or from the unfinished / interior side. 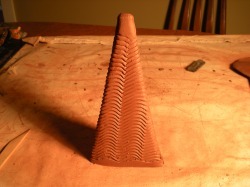 One of my favorite uses of the AccuAngle is to create blind seams by cutting partial bevels on the unfinished side of the clay. 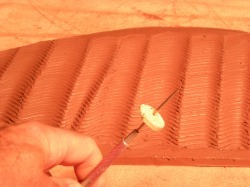 This allows me to make a folded seam without disturbing the textured surface on the finished side of the slab. First I cut a 90 degree along the base. 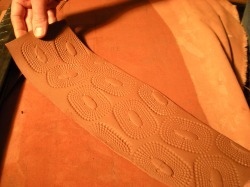 The next step is setting up the needle tool so that it only cuts about two thirds of the way through the slab. 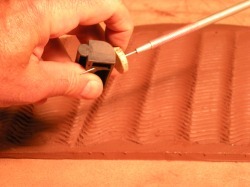 This can be done by using a piece of tape as a "stop" to limit how far the needle tool extends from the sliding cutter. 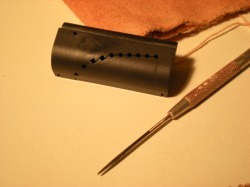 An eight of an inch slice from a wine bottle cork is also a good stop material and more easily adjustable than tape. 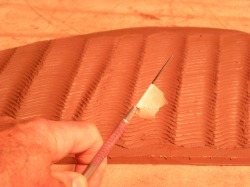 Flip the textured slab over and define the vertical seams of the object. 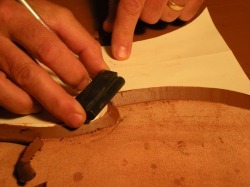 Cut a "v" groove centered on the seam line by cutting bevels in both directions. 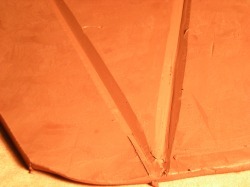 In the photo below 30 degree angles were cut on either side of the seam line.